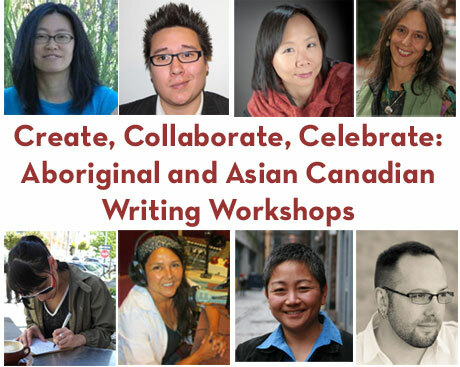 The Asian Canadian Writers Workshop and Aboriginal Writers Collective West Coast are pleased to announce a series of writing workshops and public readings the weekend of October 13 - 14 with cutting edge and award winning writers. The workshops will take place at the Strathcona Community Centre (601 Keefer Street) with Saturday night's public reading taking place at Rhizome Cafe (317 East Broadway) and Sunday night's reading taking place at NEC Native Education College (285 East 5th Ave). Flex and train your creative muscles by attending one or more of the workshops co-facilitated by Aboriginal and Asian Canadian authors. Anyone interested in writing and the opportunity to receive feedback from published writers is welcome to register and participate. Writing from these workshops maybe selected for publication in an upcoming issue of Ricepaper magazine. Aboriginal and Asian Canadian authors include: Joanne Arnott, Hiromi Goto, Rita Wong, Mercedes Eng, Jordan Abel, Daniel Justice, Janet Rogers, Fiona Tinwei Lam. The workshop topics include Ancestors, Language, Youth, Land/scapes, Speculative Fiction.